(l-r) Danau Girang Field Centre Director Dr Benoit Goosens, Sabah Tourism, Culture and Environment Assistant Minister YB Datuk Pang Yuk Ming, Sabah Wildlife Department Senior Wildlife Officer Mohd Soffian Abu Bakar and Oxford University’s Wildlife Conservation Rescue Unit Director Professor David Macdonald CBE DSc FRSE at the opening of the Sunda Clouded Leopard workshop here yesterday. 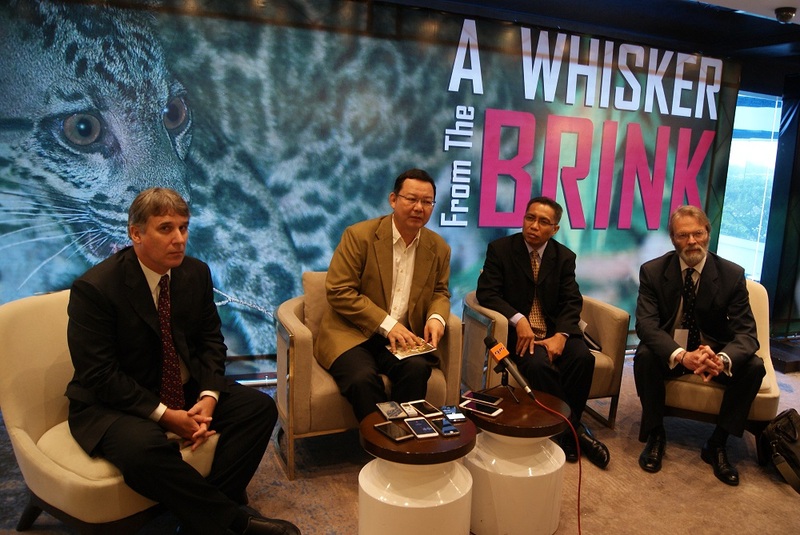 Kota Kinabalu, 12 June 2017 – International and local scientists, governmental agencies as well as industry players are convening again to save another iconic and endemic species to Sabah, the Sunda clouded leopard, just four months after proposing recommendations towards the conservation of the proboscis monkey. The Danau Girang Field Centre (DGFC) and Sabah Wildlife Department (SWD) are organising a three-day workshop attended by subject matter experts. Recommendations will be proposed to protect the Sunda clouded leopard based on findings of a five-year extensive research on the endangered species conducted by DGFC and SWD. A Sunda Clouded Leopard Action Plan for Sabah will then be drafted based on the proposed recommendations gleaned from the workshop. DGFC director Dr Benoit Goossens said he hopes that the Sabah state government will adopt the Sunda Clouded Leopard Action Plan for implementation to save the species, which is threatened by habitat loss and forest fragmentation in Sabah. “During this project, we have carried out surveys using camera traps in several protected areas such as Crocker Range, Tawau Hills Park, Tabin Wildlife Reserve, Kinabatangan, Malua, Ulu Segama, Maliau Basin and others. The population is estimated to be around 700 individuals in Sabah,” added Goossens. Dr Goossens said the workshop will see input from relevant stakeholders, including government department officers, representatives from NGOs, tourism and palm oil industries. Yayasan Sime Darby (YSD) has been supporting the DGFC since April 2011, with a total commitment of RM3.96 million over a period of six years, to conduct research on three species – Proboscis monkey, Sunda clouded leopard and the Bornean banteng. Earlier this year, DGFC and SWD organised a workshop and conference on the conservation of the Proboscis monkey, which saw recommendations proposed towards the drafting of a state action plan to conserve the endangered species. DGFC is currently in the midst of drafting the state action plan on the conservation of the Proboscis Monkey to be submitted to the Sabah state government. YSD Chairman Tun Musa Hitam said the Foundation is waiting in anticipation for the submission of the state action plan on the conservation of the Proboscis monkey to the Sabah state government. “We also hope that the same will be replicated for the Sunda clouded leopard, which is one of my favourite animal species due to its sheer beauty. This species, like many others, is under severe threat from poachers, habitat loss and fragmented forest areas. “We must act immediately and effectively to stop further decline in the population or risk losing a precious species that is vital to the ecosystem it inhabits. We have already lost one of our last three Sumatran rhinoceros, a species on the brink of extinction. Let us learn from this and work even harder to save as many of our endangered species as humanly possible,” he added. The Foundation has also sponsored two Sabahan students, Gilmoore Bolongon and Leona Wai, who have enrolled at Universiti Malaysia Sabah to pursue their Master’s degrees. WildCRU staff Andrew Hearn said YSD’s support aided research on the Sunda clouded leopard as it enabled the collaring of four leopards along the Kinabatangan River, in the vicinity of DGFC. “The information collected from the GPS collars has allowed us to estimate the home ranges of those individuals and provide vital information on their movements in degraded and fragmented habitat, and the use of natural corridors,” he said, adding the results will be discussed at the workshop. Under its Environment pillar, to date, YSD has committed RM131 million towards the protection of high conservation value ecosystems, vulnerable and endangered species as well as initiatives promoting the preservation of the environment and biodiversity.